All transcriptions are ready! The lesson transcriptions use the Soundslice interactive notation. Click on a chapter to view them! 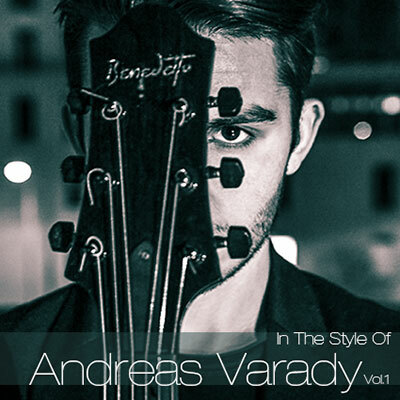 An in-depth study on the Jazz style of guitarist Andreas Varady. -Lessons where Varady shares his approach to music. Andreas Varady was born in Slovakia into a Hungarian Romani family. He began learning guitar at the age of four under the direction of his father, Bandi. In 2007, his family moved to Limerick, Ireland and after two years of busking in Limerick and Cork, he met Irish drummer and producer David Lyttle after writing to him on YouTube. Lyttle began featuring him in his band and in 2010 produced Varady's debut album Questions for Lyte Records. The release of Questions and Varady's growing presence on YouTube brought him to the attention of Martin Taylor, Louis Stewart, Tommy Emmanuel, and later Quincy Jones. In 2011, when he was 13, he performed at Ronnie Scott's Jazz Club in London and is the club's youngest headliner. Varady appeared on the front cover of Guitar Player magazine, and at festivals in France, the UK and the South Pacific. In 2012 Varady was invited by Claude Nobs to perform at Montreux Jazz Festival as part of Quincy Jones's Global Gumbo, which Jones presented. Varady performed with the same group in New York and Los Angeles later in 2012, and signed to Jones's management company in January 2013. Varady signed a deal with Verve Records in October 2013 and recorded his first album for the label in January 2014. The first album, Andreas Varady, was produced by David Paich, Jay Oliver, and Quincy Jones and was released in August 2014.